PuffDadE have done it again!! Another new battery that is shaping up to be an amazing cell!! So, time and time again we are asked “What is the best battery to use for this that and the other”….Well, Lets take a good look at what batteries in MY opinion you want to use and why and talk about these new batteries we have just tested!? How about that!? 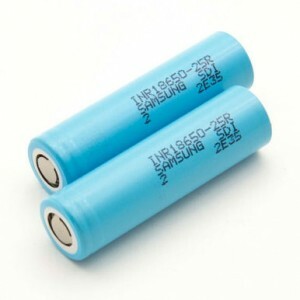 Samsung 25r, for a long time now the Samsung 25r has been an absolute must, it is a beautiful battery both reliable powerful and continues to pump the amps at a higher rampage for longer on your mechanical mods! 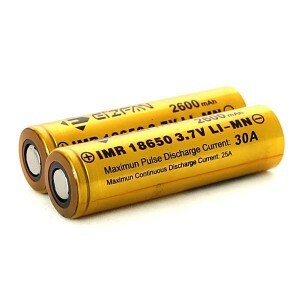 I personally love them and always advise buying these they are a 2500mah Battery capable of 20amp continuous, but will pulse happily at 100amp maybe more depending on how brave you are feeling at the time! They are reliable above all else!! and they are a solid battery to use! Now no one can forget the mighty Sony VTC4 and 5 Cell, these were the king of batteries for a long long time and there is still nothing wrong with them! In fact they are more than encouraged as well!, they are still a great cell, how ever for me personally I hardly use them any more as I feel there is just so much “Better” if you will! These babies how ever, allow for some pretty amazing builds and are still super stable I mean mine lasted for a long long time before they started to become tired! The Efan 40mp, I can remember when I was given these to test by Paul Law at Puffdade, I was shocked beyond belief at their performance, I mean he gave me a set at 12 Midday asked me to put them through their paces properly, So I build a 0.07 ohm coil, and I went to town on this one cell like crazy trying to see if it was safe to use if it would vent how well it lasted etc, Well I kid you not, I blasted it at that Ohms till 3 o’clock the next day came back to the shop with the same battery (which hadn’t been charged by the way) and it was STILL kicking like it had just been charged….totally awesome! Now, lets talk about these new batteries! Paul Law again handed me and a couple others a pair of these batteries! And its a true “OMG” moment!…Ok so what are they? 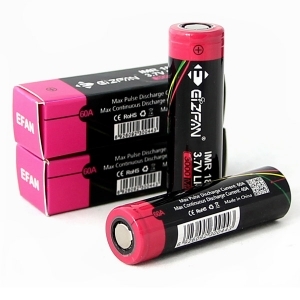 they are the new Efan IMR 18650 LI-MN battery, 300mah 40amp continuous and 60amp pulse rating. Now Paul Law is extremely safety concious and always looking out for his users, he will never put a new battery out there without it being ran through its paces properly but experienced users who really do go to town on them. Now we have a guy who knows batteries he has some proper machines that really push these batteries to their limit, and the word so far after testing them through 4 full charges and discharges is that the cell will take an average of 3250mah on a cycle and here is where it gets interesting, will PULSE at 102.3 amps at 0.02 ohms. Now this report back on them, you might find them different! how ever….for me? These things are insane! I already love them! Now I am not the most technical guy on the planet I can only give you the way I see it from my point of view, But as mad as it sounds? I actually feel a difference in my REGULATED box! that is awesome! Over all, these things are shaping up to be one of the best batteries I have ever used! They are 3000mah so you get longer out of them before they need a charge, and although it tells you 60amp pulse, we pulsed at 102.3 amps so take our findings so far as you will!! Over all these are the batteries I use, I buy my batteries exclusively from Puffdade (www.Puffdade.com) Paul Law, as he always seems to be ahead of the curve and has true knowledge on batteries and he does it the right way, He puts them through their paces properly before selling them and makes sure he is always delivering the highest of quality when it comes to batteries. Paul a big thank you to you for allowing us to test these babies out! I am off to go put a fresh set in my box, and vape happy! !